A delegation from Cambridge's twin city of Heidelberg in Germany joined in a special service to mark the centenary of the end of the First World War. The event also featured the choir from King's College. Meanwhile in Godmanchester the granddaughters of a serviceman who fought in the Great War travelled over from Canada to pay their respects. On Sunday 11th November, several regional events will mark the centenary of World War I. Find out more with ITV Anglia's brief guide. Bob Parks and Herbie Bright fought in Germany together. Credit: ITV Anglia. Two war veterans have been reunited after 40 years not realising they were living just three miles away from one another in Cambridge. Bob Parks and Herbie Bright fought side-by-side during the Battle for the Rhine and the push into Germany. They also served in Egypt and Palestine. 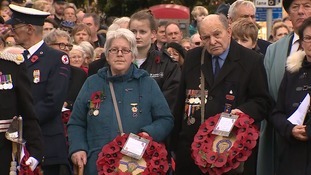 They lost touch after serving with the Suffolk Regiment - now part of the Royal Anglian Regiment - during World War Two. Bob, known as Bonny, often spoke about his old friend so his wife Patricia decided to track him down.